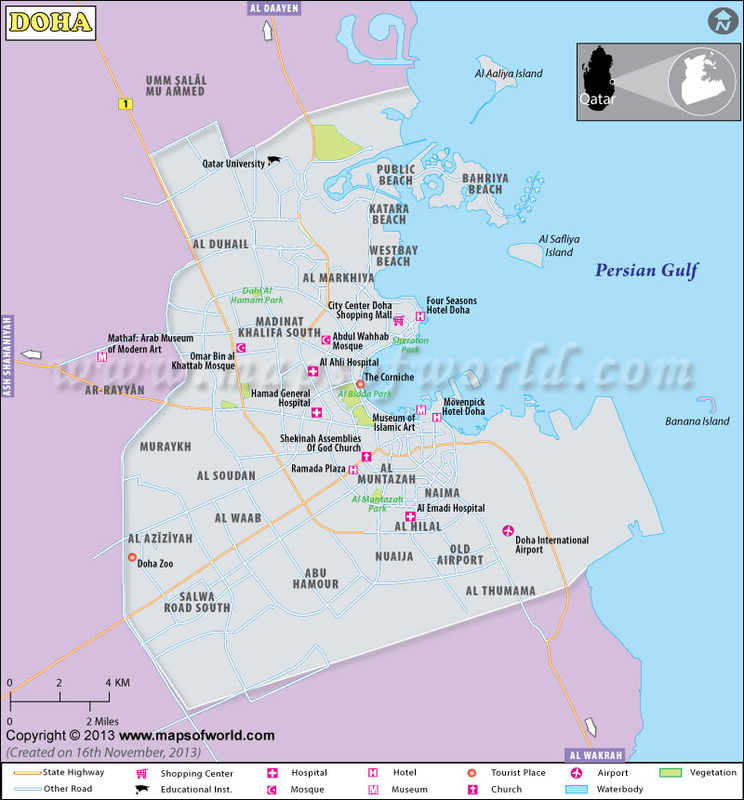 Located on the Persian Gulf's coast, Doha is the capital of Qatar. With an approximate population of 796,947 in 2010, Doha is the largest city of Qatar. Around 60% of the nation population inhabit in this city or its neighboring suburbs. It is also considered to be the economic hub of the nation. It's one of the municipalities of the nation and houses the Education City as well. Sprawled over an area of 132.1 square kilometers, the city was home to the 2006 Asian Games, and 2011 AFC Asian Cup. It will also serve as a host to the 2022 FIFA World Cup. Doha is considered to be the commercial hub and largest city of the nation. It lies on the eastern coast of Arabia as well as the fronts on the Persian Gulf. By Air:Doha International Airport forms an integral part of the Persian Gulf Area. Besides, the Qatar Airways connect the city with major destinations in Europe, Australia, Asia, Africa, India, and the United States. People residing around the Persian Gulf area, will find FlyDubai and Air Arabia as the cheapest options for traveling to Doha. By Car:Saudi Arabia is the sole nation which borders Qatar and it may be difficult to get permits for driving via the same. However, in future it is anticipated that various bridges will be established to link Qatar with the United Arab Emirates and Bahrain. You can also hire private cabs for getting around the city. The cabs are air-conditioned and environment friendly. By Bus:To get around within the city, you can avail public buses or hire cabs. Formerly, there were only two bus routes for people to avail. However, by 2006, six new routes were introduced and today the city is home to a wide channel of routes that covers the entire city. The city enjoys a hot desert climate. Summers are extremely long in Doha and range from May to September. During these months, the temperature may rise up to 50°C. The months of June and May are the least humid. During summer, dew points may exceed 25°C. Throughout the summers, the city gets almost no precipitation, and rainfall is also scarce during these months. Winters are cool where the temperature can drop to less than 7°C. Doha International Trade Fair: Organized at the Qatar International Trade Fair, this annual event lasts for one week. Traders across the globe make it a point to be a part of this event. In fact, this event plays a viable role in promoting Qatar as a superb tourist destination. Annual Doha Cultural Festival: Organized in the month of March, this event lures thousands of tourists every year. Here you'll get an opportunity to witness the cultural aspect of the city. Doha Tribeca Film Festival: This annual film festival is arranged for five days. It was initiated in the year 2009 so as to promote Arab as well as other international movies. One of the biggest events in the city, every year it lures about 50,000 guests. Staying in Doha for a short while and completely confused about what to see? Well, the city offers a couple of attractions that are sure to make your trip a memorable one. To witness the essence of culture and heritage of Doha, why not visit the various towers and forts of the city. For instance, the Doha Fort houses some of the best traditional handcrafts of Qatar as well as several wooden ornaments. The other forts and towers that are worth visiting when in Doha are Al Wajba Fort, Al Wakra, Al-Zubarah town, Al-Jassasiya, Barzan towers, Al-Wsel, and Katara Cultural Village. Shopaholics can find a good time hopping from one shop to the other when in Doha. If you are keen on shopping for either modern or traditional things, Doha has it all. The major shopping outlets in Doha are Villagio Mall, City Center Doha, Gold Souq, Landmark Mall, Souq Waqif, and Exclusive Boutique on the Pearl Doha. To witness the real essence of Islamic Arts, make sure to visit the architectural wonders of the city including the Museum of Islamic Arts, Grand Mosque, Qatar National Museum and Aquarium, Mathaf Arab Museum of Modern Art, and Islamic Culture Center. On your trip to Doha, don't forget to enjoy a cruise ride on the traditional "Dhow". You can also enjoy the sandy beaches, water sports, golfing, camel racing, and horse racing, when in Doha. The Arabian Sanctuary or Al Maha Sanctuary in Doha houses the Arabian Oryx, an endangered desert deer species. Those eyeing a luxurious option can plan their stay at the Four Seasons Hotel Doha, W Doha Hotel & Residences, Oryx Rotana Doha, Marriott Executive Apartments Doha City Center, or Renaissance Doha City Center Hotel. On the other hand, if you don't want to spend much on your vacation then look for stay options like Diamond Hotel, Le Mirage Sharq, Qatar Palace Hotel, and La Villa Inn Hotel Apartments.